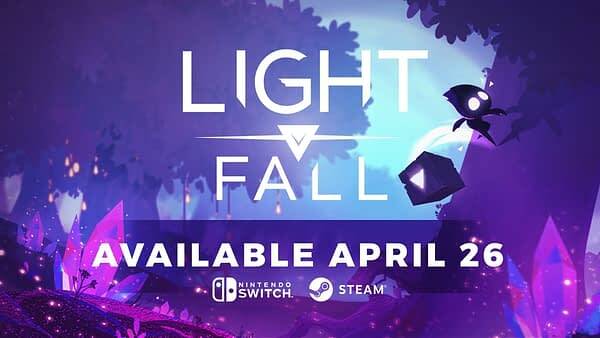 Bishop Games have confirmed the release date for Light Fall, their 2D platformer, which will hit Steam and the Switch on April 26th, 2018 after being delayed last month. Light Fall has a pretty obvious resemblance to a few other indie games, between the side-scrolling 2D platformer setup, the color pallet, even the design of the protagonist. Which meant, when I played the game back at PAX East, I had some trouble trying to find a part of it that was truly unique. In fact, the thing I found most unique about the game was its use of boxes in a world that hates loot boxes. Light Fall may not be the most visually different game, nor is the gameplay too much different despite boasting a “versatile, player-controllable platform,” however it does have its compelling moments. The game follows the story of a young boy on a quest through the mysterious universe of Numbra, a land where darkness rules over light. He’s venturing into the dark to rescue a friend who vanished into the night. Using the magical shadow core and his companion owl Stryx, the boy braves the entire continent in search of his friend. Which is a decently touching narrative. Light Fall will hit Windows, Mac, and Switch on Apirl 26th. You can check out the launch trailer below.